'Wanganui Gem'. (Jean Stevens by Bay of Plenty Iris Group, R. 1999). MDB, height 6-8" (15-20 cm). Midseason bloom and rebloom. Standards dark mauve; falls purple; beards white, tipped yellow; slight fragrance; summer bloom taller, branched. 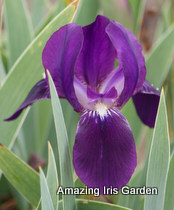 Purple I. chamaeiris X 'Madonna'. In commerce in New Zealand since circa 1930 as "The Gem".